Advertising materials had described Rio as one of the most beautiful cities in the world, and they were right! Whichever direction I turned scenes of beauty met the eye. Along with the beautiful there were spectacular sights to behold. A giant statue of Christ dominated the horizon and could be seen on approaches to the city from all directions. Massive extinct volcanic cores rose like needles from the coastal plain, each enshrouded with a halo of hang gliders in multi-coloured splendour. We were glad we didn’t have to drive as it allowed us to sit and absorb sights and sounds from the safety of our bus seats. Concentrating on meetings when they eventually started and which we’d travelled half way around the world to attend was an exercise of high discipline. Weighty matter were being discussed, but within the periphery of our vision through plate glass walls of our sleek skyscraper hotel the omnipresent hang gliders tempted us to follow their daredevil feats as they lazily circled mountain peaks which almost appeared to be level with our field of vision and in close proximity. On the whim of the moment they’d dart to a landing on golden beaches several stories below our meeting level. How could one resist watching this entertainment? We’d seen signs advising tourists to walk in groups and stay within protected areas. Advertising leaflets had given us similar warnings and announcements had been discreetly made urging that we use extreme caution as we moved around and be on the alert. These warnings had been reinforced by a report circulating within the delegation. One woman who’d been shopping had her bag snatched by a fellow who’d jumped on the back of a waiting motorcycle to escape and she was lamenting cancelling credit cards, loss of cash and passport with all the bother getting replacements. Then riding a city bus with some of the delegates I’d heard a shout of anger and was almost knocked over by a man retreating from the back door of the bus. He quickly melted into the surging mass of humanity outside. It appeared he’d grabbed eye glasses one of the delegates was wearing. Apparently nothing carried or worn was safe. I assured my friend it was good he wasn’t wearing contact lenses or they’d have taken his eyes with him. My friend was not amused. But bus trips between meetings to some of the notable sights such as the cable up to the statue of Christ and other tourist traps lulled us into a sense of security and these incidents were gradually put out of our mind. We reasoned this could have happened in any major city of the world and we needed to be cautious with our things wherever we went. Nothing of note had happened to the majority of the delegates. How could there be anything seriously bad among so much beauty? It was toward the end of these meetings the unthinkable happened. In the middle of the concluding exercises proceedings were suddenly interrupted by the appearance of a dishevelled member of the organizing committee who, in front of assembled dignitaries shouted his distress. It appeared he’d decided to take a quick trip to the beach to add to his photo collection and return for the concluding talk. In spite of warnings given he’d strayed outside the protected area in front of the hotel and prepared his expensive camera for some quick beach shots. He was outside protection, and he was alone. But he wasn’t really alone, he was observed by men always looking for an opportunity to make their miserable lives in the slums of Rio more comfortable. My friend suddenly realized he was not alone as he prepared to place the camera in its case and return to meetings. The circle of men complete one rough fellow pointed to the camera and walked forward to retrieve it. This was of course resisted and the circle closed in throwing sand in the eyes of my friend and beating him as they relieved him of camera and other valuables. Barely able to see my friend stumbled back toward the hotel, bruised and torn where he was found by security and ushered back into the safety of the hotel reception. He was aware of loud laughter following him from those sunbaking and playing ball on the beach. They’d watched the entertainment without any one venturing help. After all it was only a tourist and the thinking was all tourists were rich and could well afford sharing their wealth with those less fortunate. As we watched this man standing shouting his recent experience on the beach those of us more cautious were thankful for our caution. The loss of a bag or glasses was irritating, but to be attacked physically was quite another thing. All of a sudden the beauties of Rio were eclipsed by the spectacle of one standing before us bruised and bleeding from his ideal. His torn clothes further evidence of the truthfulness of his story. Meetings were concluded on a sober note. So if you’re inclined to visit Rio by all means enjoy its beautiful surrounds, but do so with a reputable tour group and make sure you take cautions about moving around and protecting your valuables seriously. Yes we can’t just vegetate in our homes. I can recommend travel to Rio as it’s worth seeing and like any other country the great majority of people are decent law abiding citizens. But when you travel to any country you’re not familiar with its best to be with a reputable tour group or tourist specialist if you don’t know the language. Read up about the place in advance and that will guide you about places to avoid walking around alone. As you noted, our so called developed countries are dangerous places these days too. this had me riveted all the way through and didn’t disappoint as you skilfully reminded us at the end of the vivid contrast between enjoying the beauty of nature and the surrounds as contrasted with the ugliness of brutality and unkindness. Our nation is getting to be a dangerous place to live now Barb too. The great majority are decent people but the minority get off in our so called justice system with a rap over the knuckles and are turned loose to cause us grief again. And a lovely opening description, Ian. I only went once but it was a trip to remember. You would be OK if you are with a reputable travel group. So many of the places I would love to travel to are also so unsafe today. I balance safety against my desire to see and sometimes the weight of safety wins. This was a terrible experience for your friend and also shows just how bad humanity can be. Unfortunately Western so called developed countries are not safe to live in any more Val either. 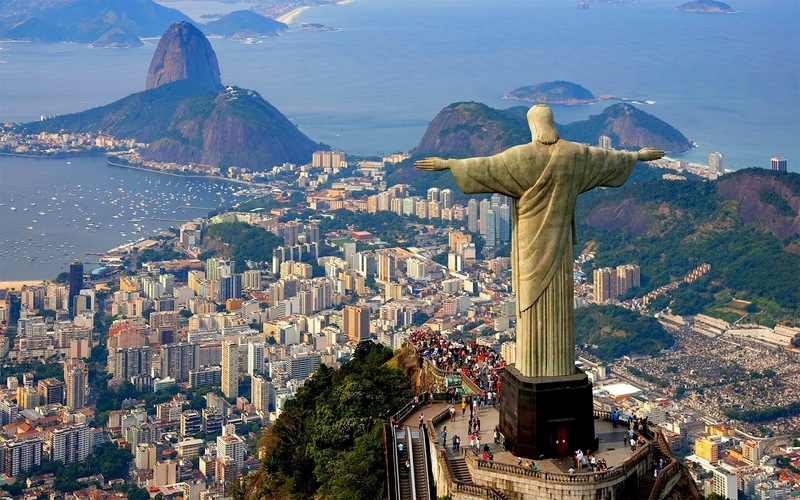 I’d say by all means visit Rio but make sure you are with a reputable travel agency you know will book you into safe places and look after you while you are there. Rio is a beautiful place. What a terrible experience it must’ve been for your friend, and for your entire group to witness him in that condition. The perception among (a certain kind of) locals of tourists as outsiders, as easy game, as people loaded with money who can easily be stripped clean of it without causing them much distress, is something that needs to change if emerging countries want tourism to be the kind of revenue-earner it *can* be. In India, the Government has just begun working on building a safe environment for tourists, but there’s such a looooooooong way to go still. India will always be a prime tourist destination and the country has made huge strides since I first went there to live August 19, 1965. I enjoyed my 20 years there. 🙂 I don’t suppose I’ve asked you this before (sorry if I have already), but where in India did you live for those 20 (!) years? Did you stay in different parts of the country, moving a lot? Yes in some countries where there are ghettos inhabitants are at constant risk. But our own so called developed world is not that safe these days either. Boy, you had me in pins and needles. I thought you were going to say someone was murdered, but assault is almost as bad. Thank goodness it wasn’t worse, but I feel terrible for your colleague, and for you all as it must have been nerve wracking for the remainder of your trip. Well written, as always, and entertaining, also as always. Well I suppose murder would have been out of the question in such a crowded situation but no one seemed too concerned about the roughing up he got or the loss of camera by spectators on the beach. WoW! We visited Rio a number of times when working in Argentina but had never encountered what you describe in this story. But we did see this happen in Panama to a number of passengers on our ship. We were told where not to go but some disobeyed and payed to consequences. It was sad when they related what had happened to them. It was sad, but . . .
We live in an unsafe world now. Even in my country its not as safe as when we grew up and could go anywhere we pleased safely. I remember no one locked doors or windows in those days. I love your travel reminiscence’s Ian – this one way no exception. . It is unfortunate that visitors to many of the cities of the world are at risk due to their misunderstanding of local mores and taboos. I wonder if the inhabitants are at so much risk? This is sad!